Hello. Thanks for accepting me onto your site. 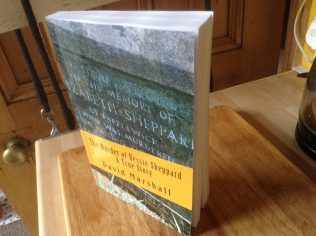 Some forty odd years ago I became interested in the story of Bessie Sheppard. I’m sure your all familiar with it so I won’t go into that now. What started as an interest, over the ensuing years, blossomed into a full fledged obsession and has now culminated in a new book entitled “The Murder of Bessie Sheppard” which is now available from Amazon.co.uk. My initial interest was aroused because, for such a well known story, there was such a dearth of information in public records. I made it my business to discover as much as there was to discover. The man found responsible for the murder, Charles Rotherham, never had any defence put forward in his name. He had allegedly confessed, but there were many contradictory elements to the story. I made it my job to provide him with whatever defence I could and suggest alternative explanations for the occurrences of July 1817. Finally, because I had taken it upon myself to defend Rotherham, I felt a need to assuage my guilt with regard to Bess by finding those who had never been found before – her family descendants, to whom I could hand her memory for them to cherish. I did find them, but in a place I could never have anticipated. Should you wish to read it, I hope you enjoy. It’s been a lifetime ambition to get Bess’ story told. I hope she approves. I’d just like to let people know that I’ve put out a second paperback edition, identical to the first, but more compact and therefore less than half the price. I’ve also forgone all royalties to make it a better bargain. Included is a different cover depicting two of Bess’ Peruvian descendants who visited in June 2017 and whom I was proud to meet. There’s also a brief, extra section on what happened after the book came out. There’s also a Facebook page, ‘The Murder of Bessie Sheppard’. Please feel free to join. It includes many extra photos surrounding the story. I’ve just got this on Kindle, cant wait to read it as I remember the story from a child and used to look out for the stone when passing in the car. Wasn’t aware of the book availability, I posted not long ago on this subject, enquiring as to whether Bessie’s stone was still in place. I will no doubt get a copy of the book on my next visit to Mansfield, it certainly looks interesting.